Our everyday lives are so busy. Our days are so full. Our world is so noisy. We fill our lives with activities. We are at the mercy of our commitments. We have an incessant need to be occupied. We hasten. We seek to do something—anything. Often, our identities are defined by mere ‘doing,’ not ‘being.’ Many of us struggle to find a few minutes to just sit quietly and clear our heads. We cannot afford some space to think and just be. We hardly ever pause to contemplate our experiences or reflect on the life we’ve been missing in a world overwhelmed by distractions. To counter all of our exhilarating movement, we must balance it with an escape. We need space and stillness. When we remain still, we are struck by the realization that our noisy outer world is nothing but a reflection of our cluttered inner world. Pico Iyer and his family lives in a modest home in the countryside near Kyoto without internet, television, mobile phones, or even cars. We all know that in our undermined lives, one of the things most undermined is ourselves. Many of us have the sensation that we are standing about two inches away from a huge canvass. It’s noisy. It’s crowded. And it’s changing every second. And that screen is our lives. It’s only by stepping back and holding still, that we can begin to see what the canvass means. One of the first things you learn when you travel is that nowhere is magical unless you can bring the right eyes to it. I find that the best way I could develop more attentive and more appreciative eyes was, oddly to go nowhere … just by sitting still. 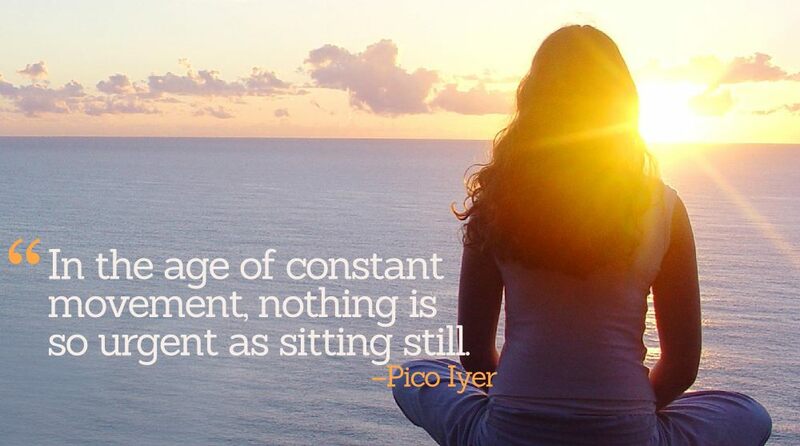 In the age of constant movement, nothing is so urgent as sitting still. 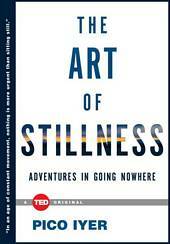 Subtitled “Adventures in Going Nowhere,” Iyer’s insightful 64-page book provides several examples of stillness in practice. 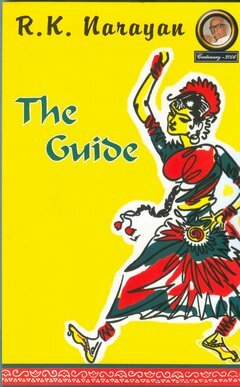 Iyer gives us glimpses into the lives of a privileged few who have found peace. 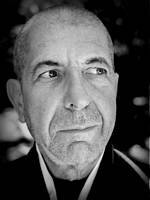 For example, legendary singer-songwriter Leonard Cohen discovered the supreme seduction of a monastic life. In 1994, after constant indulgence as an incessant traveler and international heartthrob, Cohen moved to the Mt. Baldy Zen Center in California, embarked on five years of seclusion, served as an aide to the now-107-year-old Japanese Zen teacher Kyozan Joshu Sasaki, and got ordained as a Zen Buddhist monk. Typically lofty and pitiless words; living on such close terms with silence clearly hadn’t diminished his gift for golden sentences. But the words carried weight when coming from one who seemed to have tasted all the pleasures that the world has to offer. Sitting still with his aged Japanese friend, sipping Courvoisier, and listening to the crickets deep into the night, was the closest he’d come to finding lasting happiness, the kind that doesn’t change even when life throws up one of its regular challenges and disruptions. Going nowhere, as Cohen described it, was the grand adventure that makes sense of everywhere else. It’s only by taking myself away from clutter and distraction that I can begin to hear something out of earshot and recall that listening is much more invigorating than giving voice to all the thoughts and prejudices that anyway keep me company twenty-four hours a day. And it’s only by going nowhere—by sitting still or letting my mind relax—that I find that the thoughts that come to me unbidden are far fresher and more imaginative than the ones I consciously seek out. Iyer’s “The Art of Stillness” isn’t a self-help manual and doesn’t give specific, actionable advice on how to achieve stillness. Quiet reflection and mindfulness meditation could move one’s mind in the direction of uplifting tranquility and natural stillness. Take a break from your day to reflect, to recharge and to reassess. Take a vacation from your accelerated life. Just be with yourself, genuinely center, and quiet the mind. You can achieve this centered state and contemplate when your exterior is noiseless. Then, during those still and silent moments you can come to terms with your experiences and struggles, your hopes and despairs, your ideas and judgments, your fears and fantasies.